How to find the diagonal of a rectangle? What's the diagonal of a rectangle formula? 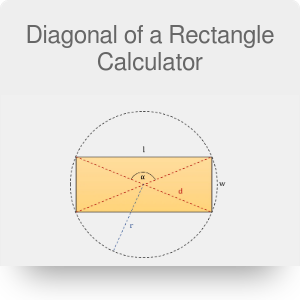 Our diagonal of a rectangle calculator is an extensive tool that quickly finds the diagonal and other parameters of a rectangle. Have you met a specific rectangle problem and you don't know how to find the diagonal of a rectangle? Try entering a couple of parameters in the fields beside the text or keep reading to find out what are the possible diagonal of a rectangle formulas. 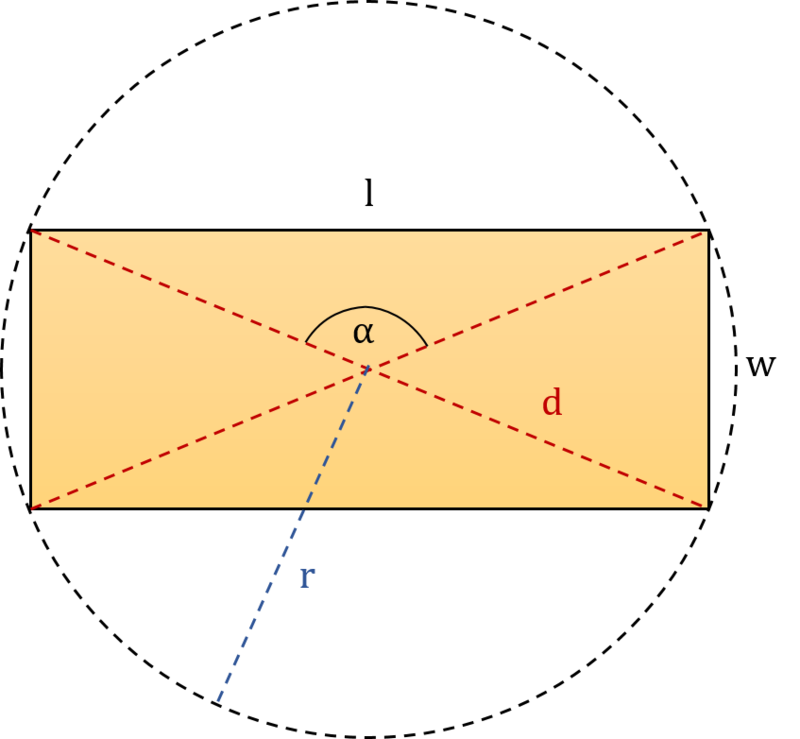 The term rectangle comes from the Latin rectangulus that is a combination of two words: rectus (right, proper) and angulus (angle). This name derives from the fact that a rectangle is a quadrilateral with four right angles (4 * 90° = 360°). Its opposite sides are parallel and of equal length, and its two diagonals intersect each other in the middle and are of equal lengths too. A square is a special case of a rectangle. Its definition is that it has all four sides of equal length, or alternatively, the angle between two diagonals is right. Go ahead on try our calculators dedicated to squares. They can quickly estimate the perimeter, area and diagonal of every square you want, just from the length of its side. The center of a rectangle is equidistant from its vertices, and therefore you can always circumscribe a circle on it. On the other hand, you can inscribe a circle into a rectangle only if it is a square. d = √(l² + w²). Our diagonal of a rectangle calculator allows you to use almost any units you want. Check out our length converter or area converter to find out how to switch between different units (SI and imperial). Circumcircle radius of a rectangle r = d/2. 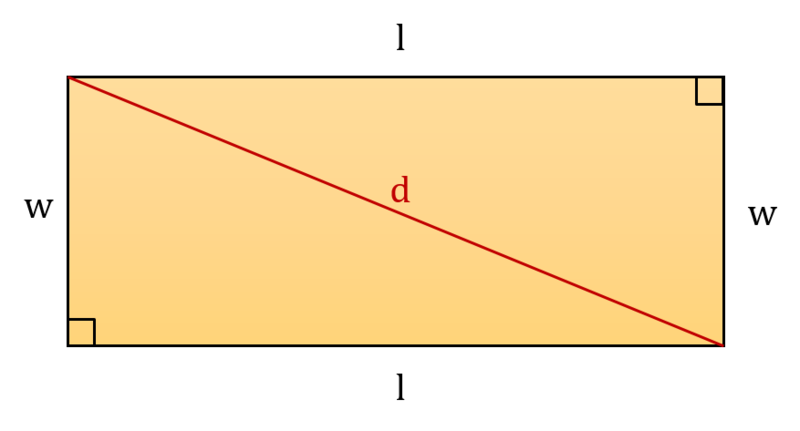 Given circumcircle radius: d = 2 * r.
Note: The angle α between diagonals is in the front of the length like in the first figure. Also, remember that the diagonal of a rectangle calculator assumes that the length is longer than the width! Did you know that there is a special rectangle called the golden rectangle? If not, head on to our golden rectangle calculator and see how you can construct golden rectangles! Diagonal of a Rectangle Calculator can be embedded on your website to enrich the content you wrote and make it easier for your visitors to understand your message.